Society has always had managers, meaning people in positions of institutional power, such as owners and overseers. In the same way, we’ve always had doctors. However, until medicine became a codified discipline that could be taught, practiced, and improved upon, we didn’t expect nearly as much from them as we do now. Today, there are better doctors and worse ones – individual practitioners differ – but the discipline of medicine has raised the average performance level of physicians well above the most gifted of their predecessors a century ago. In the same way, the discipline of management has enabled managers to contribute much more and has stretched their sphere of influence beyond their enterprises and into the larger society. Organizations are now so integral to the fabric of our lives that we take them for granted. Management’s growing effectiveness has made organizations the vehicle of choice for carrying out much of the work of modern society. We are born in organizations, supplied by organizations, informed by organizations, educated by organizations, so that we can later work in organizations – and, ultimately, be buried by organizations. Along the way, organizations fulfill our wants and needs, entertain us, help us socialize, govern us – and, yes, also frustrate and harass us. The variety of organizations reflects the breadth of human purpose. Management makes organizations possible; good management makes them work well. Over the past century, the discipline of management has transformed the experience of work and multiplied its productivity. Management’s real genius is turning complexity and specialization into simplicity and service. As the global economy increasingly gives us more intelligence and faster access to each other’s thoughts, work will continue to grow more specialized and complex, not less. So management will play a larger role in our lives, not a smaller one. 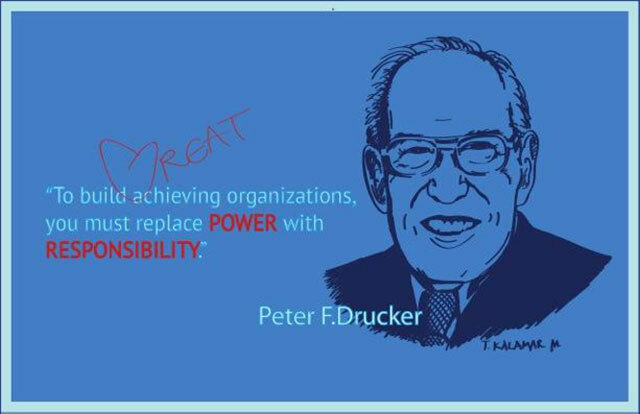 Today we salute Peter F. Drucker, the father of the discipline of management, who played a seminal role in maximizing the impact of managers and the power of their organizations. Management’s business is building organizations that work. What can be more important today for a sustainable and healthy world? Alan Mulally, please don’t go to Microsoft! As I listen to the growing speculation that you’re the favored candidate to lead Microsoft, I smile in admiration. But, I feel increasingly certain that this is not the right move for you. As you said in casual conversation more than two years ago, Microsoft needs to create a team of technological fiefdoms, shedding what doesn’t make sense, and focusing efforts on what matters tomorrow. You have what Microsoft needs: an ability to bring together an enormous range of capabilities – hardware, software – and enterprises that you’ve made mesh splendidly, bringing disparate pieces together to create a unified whole – an organization, or as you call it, One Ford, that moves itself and society forward. But, as our friend Frances Hesselbein, who taught leadership at West Point, puts it: “Leadership is who you are, not what you do.” Alan, you’re the soul of the new Ford Motor Company. By now, you are part of its DNA, just like its founder; you are in essence the founder of the 21st century Ford. Founders have lifelong relationships with their enterprises and mesh their identities with their organizations. Could Henry Ford ever have gone to another company? Would Steve Jobs have gone to Boeing? Perhaps worst of all, moving to Microsoft would take the Mulally magic away from Ford. We need only look back to Lee Iococca, another new founder whose identity was wrapped into an organization, to see what happens when such a successful founder departs for another corporation: Chrysler collapsed. As the new Ford’s founder, jumping to the next corporate opportunity doesn’t fit the values of One Ford, One Team that define what Ford now is, or who you are. For Ford to keep humming, people need to talk about you every day. You are part of the organizational lore and sense of meaning of Ford Motor Company, at least as much as Henry Ford himself was. I know you are a humble man. But, do not understate the importance of the Mulally effect on the enterprise. I hope your next job is Secretary of Education or head of the Small Business Administration – jobs where you can continue to serve in a broader capacity while your spirit and values remain associated with Ford.